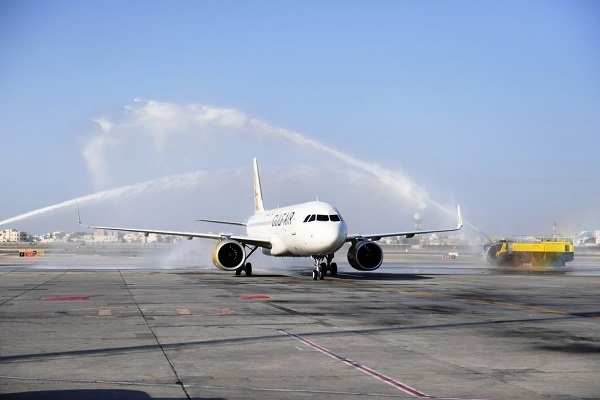 Gulf Air, the national carrier of Bahrain, is significantly accelerating its expansion in 2018 with the delivery of its first Airbus A320neo aircraft at the Bahrain International Airport today. Flying in from the Airbus factory in France, the aircraft landed at 4pm local time with Gulf Air CEO Krešimir Kučko and other airline executives on board. The aircraft received a water canon salute as it taxied to the terminal and was welcomed at Bahrain International Airport by a delegation of VIPs, dignitaries, aviation industry representatives and media members. The aircraft, which is the first of 29 on order from the A320 family, will facilitate the national carrier’s expansion plans, which include the addition of new routes and increased frequencies on popular routes and peak travel periods. "There are weeks in the summer where we have almost 200 more departures than last year per week. The addition of the Airbus A320neo will help increase frequencies to handle the influx of passengers as well as facilitate the launch of new routes for the year," Kučko said. The new A320neo will be launched on its first regional route tomorrow (August 19), flying out to Dubai from Bahrain. "We are delighted to welcome the airline’s newest aircraft and proud to be the first national carrier in the region to operate the A320neo," remarked Kucko. "The history is repeating itself, as we were the first in the region to receive the A320 aircraft in 1992,," he noted. "We have a strong network in the region with multiple daily flights to 10 regional cities and the addition of A320neo into our fleet will strengthen our position in our market," stated the top official. "The relationship we have with Airbus is very strong and we continue to work closely with them to further develop our fleet and products to maintain customer satisfaction," he added. Gulf Air currently operates 28 Airbus aircraft; and the new aircraft will fit seamlessly into the airline’s current fleet, thanks to Airbus’ overall fleet commonality, its low operating costs, optimum fuel efficiency and best-in-class passenger comfort of any single aisle aircraft. Deputy CEO Captain Waleed Abdul Hameed Al Alawi said: "As we welcome this new aircraft to our base in Bahrain, we invite our loyal customers to come onboard and enjoy the experience of flying the A320neo." "A peak travel period is upon us and I feel glad to receive this aircraft right before Eid break as people travel for holiday. This is a great milestone for Gulf Air," he added.